Sukie Curtis has been a writer and a curious human being all her life, exploring poetry in childhood, college, and into adulthood, but she came to painting as a “middle years” woman, after more than two decades of ministry as an Episcopal priest. Born in Boston, Sukie grew up in Marblehead, Massachusetts, at home with salt water, mudflats, and boats, as well as with the colors and scents of her motherʼs garden. Summer visits to Squam Lake in New Hampshire added the delights of fresh water, surrounding hills, and New England woods. Being outside among these and other landscapes is a deep source of inspiration for her. 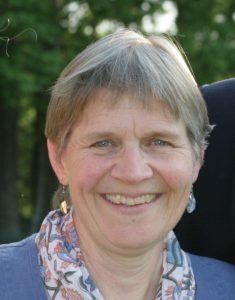 After graduating from Trinity College in Hartford, Connecticut and earning a Master of Divinity degree from Virginia Theological Seminary, Sukie began her professional path as an ordained priest in the Episcopal Church. (Sukie was actually the first woman ordained to the Episcopal priesthood on Mississippi soil in 1984.) She spent nearly twenty-three years serving Episcopal congregations in Clarksdale, Mississippi; Foxboro and Concord, Massachusetts; and Yarmouth, Maine, where she led a congregation with her husband, David Heald, while also raising two delightful daughters. In 2008, Sukie chose to be released from the responsibilities of ordination and at the same time dove into the pleasures and possibilities of oil paints. After several years of exploring non-verbal expression in paint, Sukie finds herself exploring a variety of art forms, including book arts, hand-stitching, and writing again. Early in 2019 Sukie was restored to the priesthood by the Rt. Rev. Stephen Lane, Bishop of Maine. She hopes to bring her art-making and her priesthood together and has begun to sew herself a set of liturgical stoles as one way of expressing those two paths. Sukie also maintains a small practice of “spiritual direction,” offering supportive conversation and companionship for those seeking to understand and walk their own unique path, whether in the midst of, apart from, or on the margins of traditional religious structures. Her goal is to be a trustworthy companion and champion of each person’s soul.